Do you want to make your website available in multiple languages? By default, WordPress does not come with features required to create a proper multilingual site. 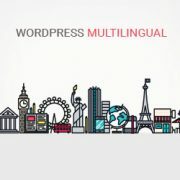 That’s why in this tutorial, we will show you how to create a multilingual WordPress site with the popular WPML plugin. 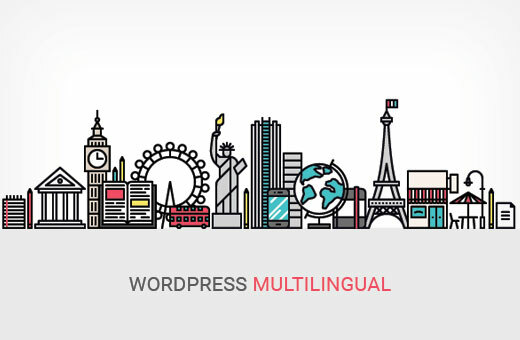 Why Create a Multilingual WordPress Site Using WPML? You can use WordPress in any language that you want. It is super easy to create a website in any single language. Most popular WordPress themes and plugins are also translation ready which makes it easy for anyone in the world to start a WordPress site in their language. However, by default WordPress can support only one language at a time. What if you wanted to use multiple languages on a site to attact a much wider audience? Governments, international businesses, and educational institutes often need to offer their website in multiple languages. While machine translations like Google Translate is an option, it’s often not acceptable for most professional organizations. One way to offer multiple language options is to install WordPress in subdomains for each language. This is a lot of hassle, as you will have to manage updates, and backup all those installations. WPML (WordPress Multilingual Plugin) solves this problem by allowing your website to become multilingual. You can use the same WordPress installation to create content into many different languages. It offers an easy to use interface for managing translations. It also adds language switching options for your users. 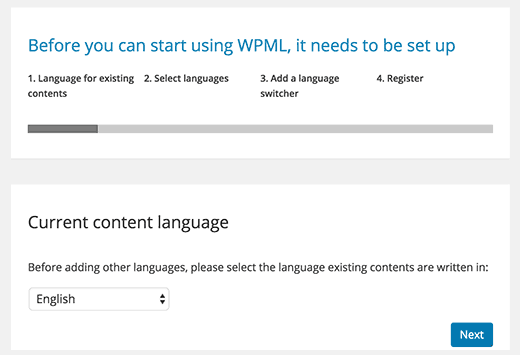 Having said that, let’s see how you can create a multilingual WordPress website with WPML in minutes. 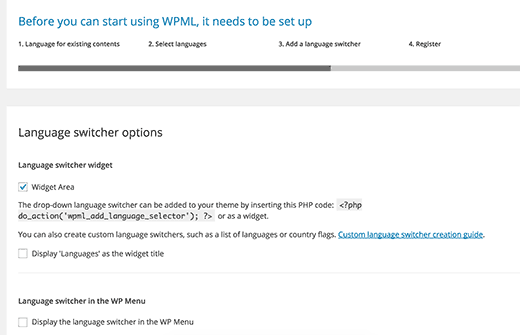 First thing you need to do is install and activate the WPML (WordPress Multi-language) plugin. For more details, see our step by step guide on how to install a WordPress plugin. Note: WPML is a paid plugin, but it’s by far the most comprehensive option. There is a reason why over 400,000 websites use WPML for creating a multilingual WordPress site. Upon activation, the plugin will add a new menu item labeled ‘WPML’ in your WordPress menu. Clicking on it for the first time will take you to plugin’s settings wizard. 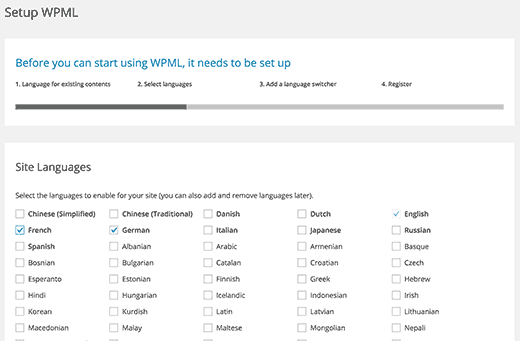 WPML will automatically detect your WordPress site’s language. You can change it here now if you want. On the next screen, you will be asked to select the languages you want to enable on your site. Simply select the languages from the list that you want to add to your site. You can always add or remove languages later if you need. After selecting your site languages, click on the next button. Now you will be asked to add a language switcher to your site. This language switcher will allow your users to choose a language to view content in their preferred language. WPML allows you to automatically add content switcher as a sidebar widget, in your navigation menu, or display as a plain list. Additionally, you can also choose to select flags or text for language switcher. Once you have made the choice, click on the next button. As the final step, you will be asked to enter your site key. If you have not generated one yet, then you can click on ‘Generate a key for this site’ button. This will take you to WPML website, where you will be asked to add the site you are coming from to your WPML account. Once your site is added, you can click on it to get to your site key. Copy and paste this key into your WordPress site. That’s all you have successfully finished the WPML setup wizard. You can now click on the Finish button to exit the setup. 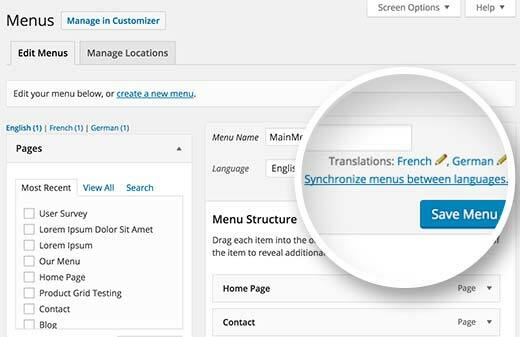 WPML makes it really easy to translate every area of your WordPress site into multiple languages. 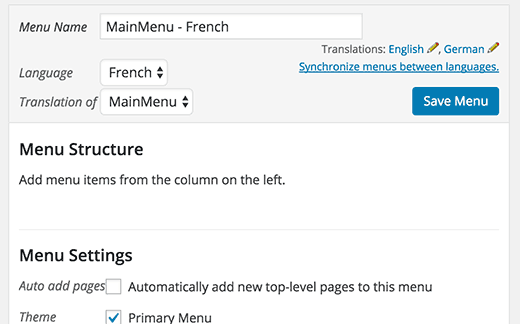 You will be able to easily translate your WordPress posts, pages, tags, categories, and themes into as many languages as you like. Simply click on the posts menu to view your existing posts. You will notice the languages columns next to your post titles. WPML assumes that your existing content is in your site’s primary language. It will show Add buttons for each language next to your posts. Click on the add button under a language to translate a post. 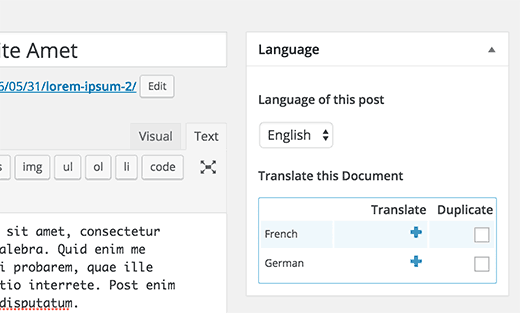 You can also manage translations by editing a post. On the post edit screen, you will notice the new ‘Language’ meta box to manage translations. You can add translated content yourself or you can add users and authors to your WordPress site and have them translate your content for you. WPML also offers a better way to manage users who work as translators on your website. If you purchase their Multilingual CMS Plan, then you can use their translation management module. 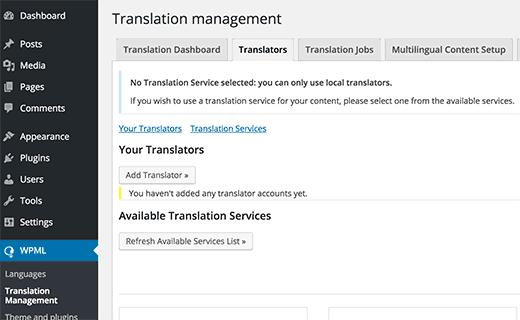 Translation management module allows you to add users as translators regardless of what role they have on your WordPress site. You can even add subscribers as translators. Instead of editing posts, these translators will be able to add translations directly in WPML. WPML allows you to easily translate categories and tags, or any other custom taxonomies that you may be using. 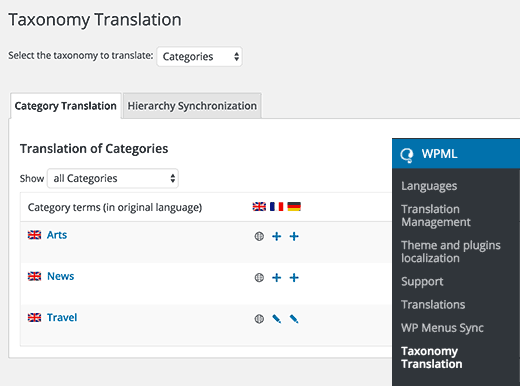 Visit WPML » Taxonomy Translation and load the custom taxonomies you want to translate. For example: in this screenshot we selected categories, and it displayed all categories from our example site. Click on the add button next to the taxonomy term to add the translation. WordPress comes with a robust navigation menu system. WPML allows you to translate it just like you would translate posts or taxonomies. Visit Appearance » Menus page on your site. If you have more than one menus, then select the menu you want to translate. In the right hand column, you will see your menu with links to translate into other languages enabled on your site. Clicking on a language will create a new menu for that language. You will need to add the same menu items as in your primary language menu. If you have your posts and pages in navigation menus, then you will first need to translate them. After that you can add them from the tabs on the left in edit menu screens. Don’t forget to click on the save button to save your menu. WPML multilingual CMS allows you to choose between official translations of themes and plugins or use its own string translator. Go to WPML » Themes and plugins localization page. By default, you will see ‘Don’t use String Translation to translate the theme and plugins’ checked. Below it, you will see another checkbox to automatically load the theme’s .mo file using ‘load_theme_textdomain’. You can check this box to see if there are any translation files available for your theme. This works only with themes downloaded from the WordPress.org theme directory. This setting doesn’t work very well for most websites. Not all WordPress themes and plugins have translations available. In some cases the translations are not good or incomplete. We recommend using WPML’s String Translation module to properly translate your theme and plugins for your own site. This module will also allow you to translate custom fields, widgets, and other translatable strings generated by WordPress. We hope this article helped you learn how to create a WordPress multilingual site with WPML. You may also want to see our list of 40 useful tools to manage and grow your WordPress blog. does it translates automatically or manually, can you explain how it will translates, some of images showing we have to select the tranlated word and check? please let me know, I am going to buy this, if it manually translates how much it takes. Do you have any examples of sites that use this? You will find many great examples on their official website under case studies section. I want to make multiple languages websites. But I can’t understand properly. Can you tell how to make. International website that can any one read in any language. but what if i my other language is RTL language, how cloud i make style turn to RTL when loading language ? how could i load RTL style when switching to Arabic language ? any one can give me the information, how can i get api response in multi language? Need for speed! Anyone have advice of how to increase speed while using WPML? Do have a problem…. I would like to know how many languages could add to my site?. I would like to add many languages to my site as I want to market to different nationalities. I would also like your advice on my site. I have paid lots of money to have my site build on fivver but all I got was a bunch of different that did not know what they were doing. The site is already built all I need is a few changes on it, I do not have lots of money as mi collect social security to survive for now. Any professional advice would be greatly appreciated. P.S I have too many pages on my site that I do not need. should I just delete the ones that I don’t need? You can add as many languages you want. Spend time on learning how to manage and update your website on your own. It will help you save a lot of money. How does WPML manage the SEO? SEO ‘demands’ separate titels and URL’s ans if only the language differs, than SEO finds just perhaps one page. I’d rather throw myself in front of a train than use WPML for anything. WPML is terrible software that uses techniques that slow down your website significantly. If you have a lot of pages, simply installing WPML can raise your loading time from 1 second do 15 seconds or worse. So, no thanks. Hi WPBeginner guys, do you have a reply for Henk’s comment? I want to have a multilingual site but if it is going to slow down my site by 15 times, it’s not worth it. What’s your take? We do not agree. WPML works just fine even on websites with lots of content. I’m very sorry to hear that your experience with WPML was not good. We take every feedback about WPML seriously and I want to help you with any problems that you had. If there is a support thread on wpml.org which explains the problems, please add a link to it.